Alabama's blue skies and plush greenery make a beautiful backdrop for your dream home. MyDreamLocale.com shows that Alabama real estate has an approximate average value of $110,630 and an average cost to build per square foot of $91. Compare that information as well as Alabama's cost of living to other states such as Texas, Florida or California, and you too will sing "Sweet Home Alabama." 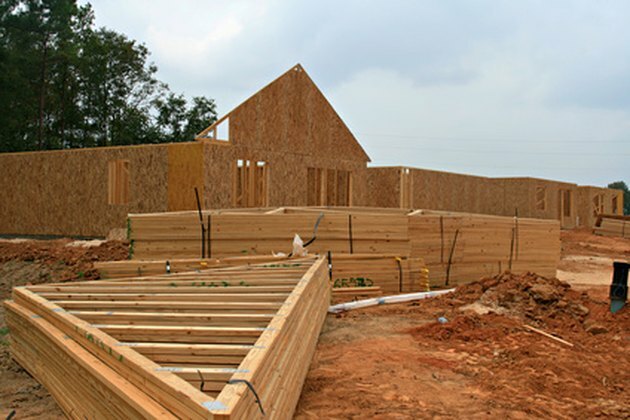 Building your dream home in Alabama will cost you less than it would in other states. Choose the foundation you will need for your home. This decision depends on your needs. For example, if you want a crawlspace, you would choose a raised perimeter foundation, which uses concrete piers to support the floors and load-bearing walls. According to Don Vandervort of Hometips.com, the most common material used for floor foundations is concrete. Vandervort also states that in warmer climates, such as Alabama, home builders choose a monolithic slab—the footing, slab and foundation are one entity. Search for the appropriate lot and neighborhood on which to build your new home. Search local newspapers for vacant lots that are for sell. Some newspapers to view are the Tuscaloosa News, Birmingham News, the Huntsville Times, The Amnibus and The Times Daily. Obtain local school statistics and information, as the location of your home dictates the district your child will attend. Choose the style of your dream home. There are many to choose from. For example, since your dream home will be in Alabama, maybe a country cottage meets your needs. For more extravagance, a southern style mansion may be more your taste. To meet in the middle a country home featuring a covered, wrap around porch may suffice. Search house plans to find the home that fits your space needs and your dream home desires. Most hardware stores, such as Lowe's, keep home construction plans on hand. You can also use the Internet to search for home plans. Knowing how many bedrooms and bathrooms you want will help narrow down the choices. Shop for a contractor and get several project quotes. Visit the Home Builders Association of Alabama online to find licensed and professional home builders and to verify a contractor's building license. Competition helps you get a better quote. Apply for a construction line of credit (CLC) to fund the building of your dream home at any Alabama bank or credit union. When you use a local financial institution, you ensure that your money is helping the community you will soon call home. From the amount of your CLC and the quote you select, you will be able to modify the budget you created early on. You may be able to make upgrades, such as adding a bonus room above the garage. On the other hand, you may have to downgrade several aspects of your home plans to make the quote fit the CLC. Manage the construction of your new home by making frequent inspections. You are paying for this project, so you need to make sure that corners are not being cut without your consent. You hired the contractors, so if that room looks a bit smaller than what the plans specify, don't be too intimidated to take measurements and make inquiries. Apply for a mortgage loan to pay off the CLC. This will close the CLC and open a new account type for your mortgage loan. Once you are approved for a mortgage loan, your dream home is officially yours.